LMA Women’s Achievers Conclaveon 9th March, 2014. Woman Achievers felicitated; Dr.Poonam Kakkar and Mrs. Farida Abraham for Academics, Ms. Manjula Juhunjhunwala for Entrepreneurship, Ms.Shachi Singh for Social Work, Ms. Lalita Pradeep for Governance, prof. Shruti Sadolikar Katkar for Culture and Mrs. Sarojini Agarwal for Life Time Achievement Award. Health Talk on Prevention and Management of Heart Diseases by Dr. Z. S. Meharwal, Director & Co coordinator, Dept. of Cardio Vascular Surgery, Fortis Escorts Heart Institute, New Delhi - 1 March 2014. Joint LMA-IMS Lucknow University CEO Forum onHuman Resources Challenge and Convergence Between Educational Institutions and Industry on 01st March, 2014 at IMS, University of Lucknow. Panelists: Mr. Amal K Das Managing Partner & CEO GoodPeople Consulting LLP, Mr. S Venkatesh former Group Head HR Vedanta, Mr. Partha P Dasgupta Advisor IIM Kashipur, Dr. C.N. Kuchroo CMD, Mega Food Park and Mr. Sachin Agarwal PTC Ltd.
LMA - Times of India Joint programme Convergent Minds….Paving way for industrial growth- A Development Conclave organized on February 28, 2014 in which 7 Investors in Uttar Pradesh viz. Hewlett Packard, Smile Park Industries Ltd, Shri Cement Ltd. PTC Industries Ltd, Samprash Mega Food Park & KK Milk Fresh, Indo European chamber of Small & Medium Enterprise andInternational Coils Ltd made presentations. 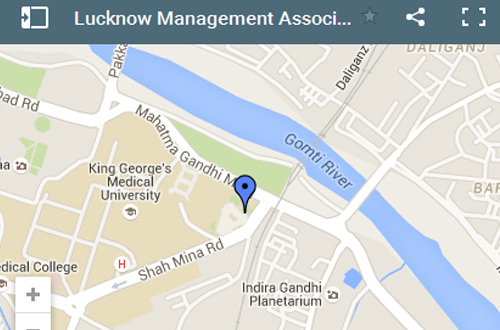 Venue: Hotel Vivanta by Taj. Newly elected office bearers with Bouquets from (left to right) Mr. Sumer Agarwal, Sr. Vice President, Mr. Arun K. Mathur, Secretary, Mr. Anant Jauhari, Vice Preasident & Mr. Vipin Gupta, Treasurer. Shri B. L. Joshi H.E. the Governor, Uttar Pradesh delivering the Valedictory Address in Annual Convention on 27th November, 2013. JK Kharbanda Memorial Lecture Series : Lecture by Dr. Sailendra Narain Former CMD, SIDBI on “Is our Business Globally Competitive in the Changing Economic Scenario” on 18th November, 2013 at Auditorium of Jaipuria Institute of Management. Acharya Shree Swami Dhruv from Pune conducted the Mind Management Workshop for LMA members on 01.09.2013 at LMA Conference Hall. SYMP held on 30.08.2013 was also addressed by Sindhuja Rajamaran Chief Executive Officer, Seppan Entertainment Private Ltd. & India’s Youngest CEO. Mr. Arvind Mohan Professor of Economics & Director Institute of Management Science, University of Lucknow was the session chairman. Mass gathering of Students & Young Managers in SYMP held on 30.08.2013 being addressed by General V. P. Malik Former Chief, Indian Army. Mr. G Pattanaik IAS (Retd), Former Vice Chancellor, University of Lucknow & Principal Secretary, U P Government was the session chairman. AIMA’S Flagship event Shaping Young Minds Programme (SYMP) held on 30.08.2013 at the auditorium of Scientific Convention Centre was addressed by Raghunath Medge & Gangaram Talekar (Dabbawallas of Mumbai) Mr. Jayant Krishna Regional Head TCS was the session chairman. A health talk on Impact of Diabetes on Heart by Prof. A.K. Srivastava, Chairman & Consultant Divine Heart & Multy Specialty Hospital on 17th August, 2013 at LMA Conference Hall. Lecture meeting on Climate Change- Hazards and the Himalayas- Kedarnath Tragedy by Mr. Deepak Sivastava, Former Dy. Director General, GSI on 25th July, 2013 at LMA Conference Hall. A presentation on Malpractices in Investment- Analysis & Way Ahead held on 06.07.2013 at LMA Conference Hall. Felicitation Ceremony of Important officers making Kumbh Mela 2013 a Grand Success on 15.06.2013 at Conference Hall of LMA, Lucknow. Hon’ble Lokayukta Uttar Pradesh Justice Shree N.K. Mehrotra was the Chief Guest on the occasion.